Original military design, M16, with 8-36 thread for direct threading into the "Cleaning Rod, Small Arms", or AR-15 with 8-32 thread to fit standard rods. AR-10 cleans the larger .308 chamber used on these rifles. 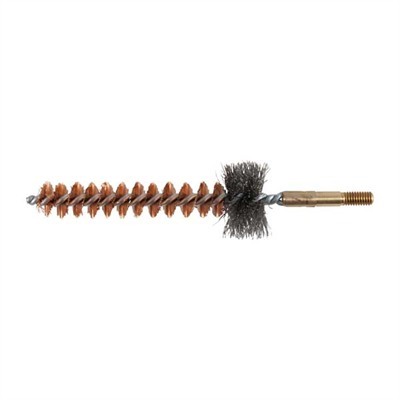 Bronze bristles fit chamber, longer, stainless steel tufts clean locking lug recesses. 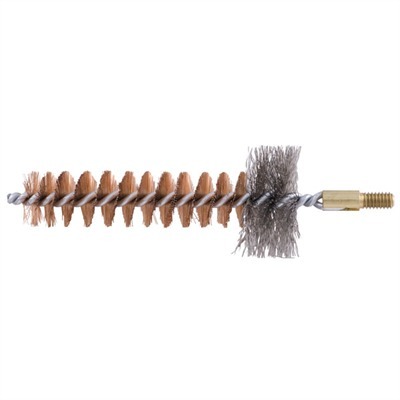 SPECS: M16 - NSN 1005-00-999-1435, has 8-36 military thread. Meets Mil Spec: MIL-B-20100C. AR-15 and AR-10 have 8-32 standard thread. M16 and AR-15 are 37/8" (9.8cm) overall. AR-10, 4 3/8" (11.2cm).